beua-store has no other items for sale. 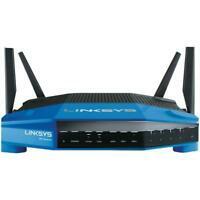 Linksys WRT1900AC is a wireless router that enables you to easily create your own network. With its 1300 Mbps 802.11 a/b/g/n/ac connectivity and wired throughout via 4-port gigabit LAN interface, the device allows multiple bandwidth-consuming applications to run simultaneously without interruptions. I bought this router because my Linksys WRT3200ACM died from overheating I suspect. The reason I purchased the WRT3200ACM is because my Linksys WRT54GL which had served my family well for around 8 years just couldn't keep up anymore. It still operates fine it just can't provide the band with demands asked of it anymore. I purchased the Linksys WRT1900AC because it was a good price. I installed it set up the security as tightly as I could using the pre-installed DDWRT firmware. I have everything running wirelessly using Wi-Fi I have a 100mb connection and various tests from around d my home are showing 46-80mb speeds. This is comparable to the Linksys WRT3200ACM I had that died on me. I tried to overload the router by running NetFlix movies in 3 rooms at 1080p running a 1080p movie from the onboard NAS off a USB drive and I had my son play a demanding game at 1080p online. The router did not fail it handled the load just fine. It's a great router for the price paid. I give it 5stars. Terrible router as-is. 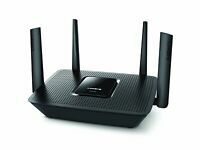 Great router if you change out the Linksys operating system to DD-WRT. I purchased this router because the tech specs made it look like a powerhouse for high speed broadband with excellent wifi coverage. Unfortunately, the router is completely unstable out of the box even running the most current Linksys software. The router would drop connections, reboot randomly to the point where it was unusable. After researching online and trying to troubleshoot, I discovered that this is apparently a long time and well known problem with the operating systems that run Linksys routers. I decided to try changing out the operating system to an open source version called DD-WRT and it fixed all of the issues and now the router is screaming fast and stable. I was a little tentative about the process but it was quite easy and now I feel like I got a great product. UPDATE after 3 months one word to describe - CRAP. about 2.5 months, I started to have to reboot router every couple of days. Sent 1st email to seller at 87 days. Sent 2 follow up emails. NO REPONSE WHATSOEVER.. Now it's past 90 days so if they ever response, I expect to hear that it's out of warranty.. BOTTOMLINE -- When it worked it was great, but I expect it to last longer than 80 days. So for me --- it's a CRAP ROUTER with NON-EXISTENCE CUSTOMER SERVICE. This is a great wifi router. Easy setup right out of the box. Great range covers 3,000 sf house and into the backyard. No more repeaters. It's fast too. No more buffering watching movies even with other computers running.. Hooked up a portable 2 TB hard drive and now have network drive that can be accessed by all of the computers in the house. Bottom line, It's a big, bulky monster size router, that looks pretty cool and performs great. I would recommend. Through a lot of trial and error and bricking the router once....I discovered that OpenWrt firmware had issues with wifi when installed on this router. I reverted to stock linksys firmware and flashed DD-WRT firmware. I could not be happier!!! I have a wifi hotspot connection as my WAN and have a local wifi network running at 500 plus Mps. My wifi as wan connection is giving me 100 to 200 Mbps down and everything is stable. The router has been up for almost 2 weeks with no drops or issues. IF you are looking for the perfect DD-WRT Router then this is it! Received this router a couple weeks ago to replace the standard router from our cable company. After using it for a bit, I'm considering going back to our cookie-cutter cable router. Regardless of how close/far we are from the router, videos constantly buffer and loading even the simplest webpage on my computer can take minutes. Maybe (hopefully) this is just my experiences and others have had better luck, but from my standpoint it's not worth the money. I was hoping to get better-quality streaming and, somehow, it's worse.